It is interesting to 'read' old patchwork don't you think? I have some 1950s bits that have pieced using the problems page of a 'woman's magazine' - all a bit surreptitious with implied meaning throughout. This is from 70s do you think - a bit more of a cheery read - Kleenex and Cornflakes! The pieces above I particularly like - much larger pieces from the late 40s possibly? Tell me: do you use cake tins for cake? Well - blow me down...things being used for their original purpose! Please note that these tins do not feature in the 'Tons of Tins' post - these are patchwork tins, not haberdashery tins. PPS: Did you watch 'The Fabric of Britain' this week? PPPS: Did you watch 'Science Britannica' this week? PPPPS: Did you watch 'The Great British Bake Off'? We would like Ruby to win because we think that she is nice. PPPPPPS: I have got the lids to these tins!!! PPPPPPPS: The book - 'The Custards - my life in tin' - is coming on a treat: full of laughs and jolly japes in the world of tin. Who knew! PPPPPPPPS: I wish that I had thought of 'Jolly Good Fellow' that is a pleasing wheeze that I enjoyed muchly. PPPPPPPPPS: The book - 'The Custards - my life in tablecloths' - is not so pleasing to write - full of stains and jam droppage. Not so many laughs in that one sadly. I look forward to reading about your Grandma Maria. Tins are very handy things aren't they! PS: Heating was on once but now off again as we have warmed up! Morning Jenny. Holding out still. Felt temped to put the log burner on last night, but choose to snuggle with a granny blanket instead.. I only use my tins for storing cakes. I'm so boring. But I have not got any vintage ones like you. I love the different colours they look fantastic. with your patchwork in. Oh I'm not so boring I forgot I keep one for my dogs.......I bake them homemade dog treats.... I know more baking. My friend tells me that a friend of her is best friends with Ruby! I will see what else I can find out!!!!! Thank you for calling in and happy to pass on any custard effect!! Thank you Barbara - we have had a warm spell so all turned off again! Hi Jenny,no we don't have the heating on. Our catchphrase is "not until November" and last year and the year before we "did it in December"! Do you know that we don't own one cake tin. I am not a baker by any stretch of the imagination which is probably why and I don't watch the Great Bakeoff either for that very reason. I like eating cakes though! Oh dear Ada Bea - you may have to use a bit of vintage sheet to give it a clean! No heating here but have brought and worn the thick jumpers and woolly socks in the evening! Wow more tins at least they are no standing there idle and empty. Which CS do you take them too, my daughter is back at Uni, I could send her off on a mission!! Love all those patchwork pieces and a view of them through the decades. Woolly socks and thick jumpers sound great to me. I take most items to the Cat Rescue on HIghland Road - simply because it is the nearest one and I can carry the load there easily! Maille's old mobile 'phone was in the window last time I looked!!! No heating as yet. I did watch the Fabric of Britain- I thought it started off O.K. but but tailed off into ...a very thin end! What a missed opportunity! So many people love knitting, and there were other fantastic designers, not just Kaffe Fasset. Gripe over.Loved the Fashionistas though mentioned by Ethel. I am envious of your patchwork tins and the contents.The hexagons are another on my to do list before I die..I'd better get a move on. I am in the slow process of sewing together some embroidered hexagons for I don't know what yet - but it will come to me eventually. There is SO much to make and do! Hi Jenny, no we havent got the heating on either but I am wearing a cardigan or jumper on top of my t shirts- a true sign that the weather is cooling (I am a big softy). Love your tins, I have wonderful recollections of being given a tin of toffees each year for christmas when I was a child and how I wish I had kept them. We called in at a house clearance place this afternoon (they dont know what to charge for stuff!!) and they had lots of beautiful ones with little kitties/puppies and other cutesies on for extortionate prices. I could look at these photos all day, they are as delicious as tins of chocolate! Twice in recent times I've found a bag of loose hexagons, the fabric looks a similar vintage to those brightly coloured ones in your tin. I love them, they are fun to stitch together, no brain power needed, and all the hard work has been done (the fabric cutting then tacking to the papers). I love your Tons of Tins, being a tin collector (hoarder) myself. Your collection is nothing short of breath-taking! Hi Jenny thankyou for your comment.Tried to make a bag but the handles went wrong!I was rushing though, must take a deep breath and tackle things s l o w l y! !Spent a lot of time sorting out my sewing area and putting things into little drawers,jars and tins! !Watched Fabric of Britain very entertaining.My favourite in TGBBO is the girl that does style over substance!although I did feel really sorry for her when her sewing biscuit tower collapsed!I have a great creative surge going on at the moment don't know wether to sew,knit or bake!! !Think I'll just browse Mollie Makes for inspiration! !Also are you a Downton Abbey fan?I can't wait for Sunday.Sorry to have nattered on,I'm going now 'byeeee! Pam. Dear Pam - please come round and we can make bags together if you wish. I do not do things slowly - I am a rusher (not Russia). Things are getting meaty in TGBBO and I get teary with the leaving thing. Sadly I stopped watching DA when that young man got up out of his wheelchair - sadly I thought that was so far fetched. I like the costumes but I am a bit fed up of Maggie Smith and her one dimension - oh dear is that ok to say. I assume that they have now reached 1970 and the place is now a theme parok - they were skipping through the decades like Dr Who in a Tardis. Oh dear! Thank you again for your extra kindness - that was most sweet of you - I was too nervous of doing the same so just fested. Thank you for calling in and I have only just got over the use of cake tin for cake!!! We're rooting for Glenn here, only have the heating on when temps drop to single figures, and tend to use pretty tins for planting spring bulbs in ... we're a rum bunch! Glenn is interesting but he needs to pull his weight I feel - very sad to see Howard go though - I thought him very droll and funny. I have just planted up my spring tins (that would be a separate collection in the shed......) ready for next year so not rum in the slightest! So many amazing looking patchwork pieces! Other than a couple of cake tins, I've only got one tin and that's full of hollyhock seeds. Yes heatings on! so is the continuous war of me turning it up and him turning it down. Oh Jenny you do make me laugh..PS can I borrow you cushions before I have to pay royalties !! Sadly royalties would be due Thea ( ho ho). A burst of heating to take that early chill away is often all that is needed. 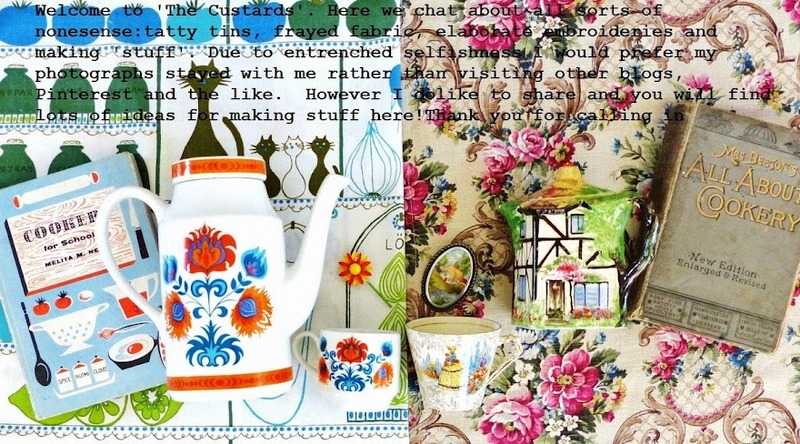 Hi Jenny, your patchwork is almost as pretty on the back as it is on the front, and a jolly good read too! Indeed Claire - once it is 'properly' on we know that we are heading for winter! Lovely tins of patchwork pieces, what glorious fabrics. I have a hankering to do some hexagon patchwork, it reminds me of my Grandma. Glorious colours and a lovely story, Jenny! My grandma's Quilting Bee in Idaho quilted me a lovely Double Wedding Ring quilt for my wedding in 1981 and I saved all kinds of patchwork. But I can see where my life has gone wrong now. I mistakenly placed my haberdashery in a biscuit tin and my patchwork in a basket and my biscuits in a cake tin. My cake is in a 1970s gold Tupperware thing that I brought to England with me in 1977. Ohhhhh, it's all gone wrong and now I know why. Thanks for setting me straight. Gold Tupperware sounds a wonder in itself - I have a bit of Tupperware but none of the gold variety. Was this an Californ-I-A import?